IMCORP's unique offering is Factory Grade® technology. IMCORP asseses cable systems installed in the field in the same manner that the manufacturers' quality control their components in the factory. This is the only way to ensure that the system components will meet their design life. Comparability to the manufacturers' test is not a simple matter. There are several key aspects to this test, without any of which it is simply not a Factory Grade® test. The manufacturers’ standards require that you energize the cable with 50 or 60Hz AC power to activate defects so they are observable during the test. Testing at power frequency allows us to observe cables systems under the same conditions at which they will be operating. Frequency of the AC signal is a direct factor in PD inception (turn on) and extinction (turn off). Competitive solutions test at .1-1Hz (deviating from power frequency by a factor of 60-600) and are unlikely to create PD events as they would happen under operating conditions. The manufacturers' standards require that you test for PD activity above the operating voltage (Uo). This is in recognition that only gross errors in manufacturing or installation will appear at operating voltage, and significant risk to system reliability still exists in PD sites which activate above Uo. 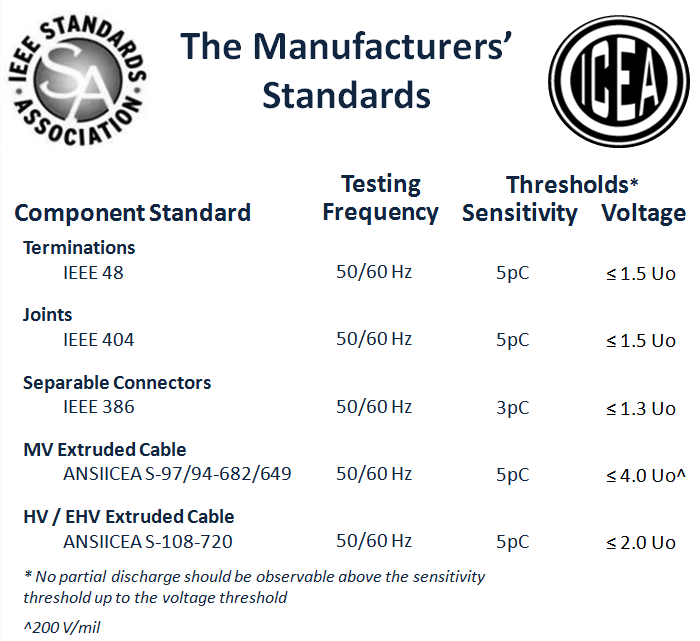 The manufacturers' standards require that you calibrate and assess the sensitivity of the equipment for each cable test. These steps ensure that the test will detect 5pC partial discharge signals. It is documented that even large defects in cable systems can sometimes emit such small pulses, omitting this step may risk missing defects that are detrimental to system reliability. Most commercially available PD systems are non-calibrated systems and cannot detect any activity below 50-100pC in the field. Background noise removal is an essential factor in discerning PD signal patterns. Our multi-stage filtering allows us to remove and lower baseline noise frequencies. This aspect of our process allows us to pick out real quantifiable PD events where competitive solutions simple see what they can see.